All plants even the so-called drought-resistant varieties need water. The difference lies in the amount of water each plant variety needs in order to grow healthy and produce high yields. 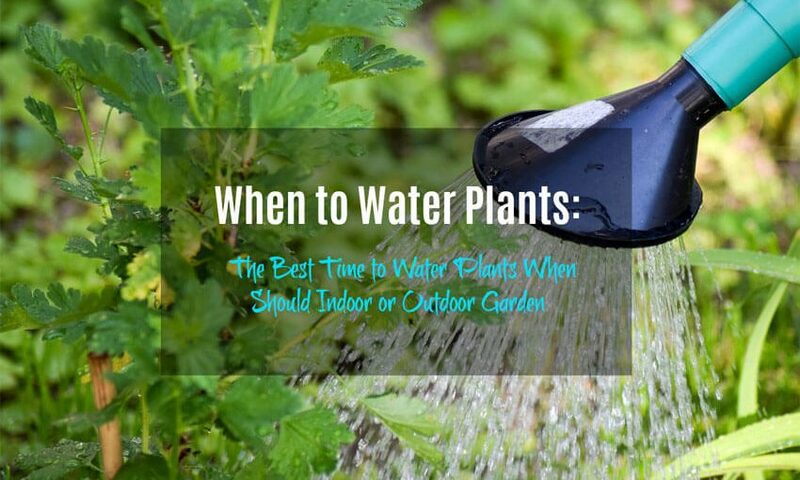 So, what is the best time to water indoor and outdoor garden? The answer to this question varies greatly depending on who gives the piece of advice. However, the fact is that only two answers are correct. 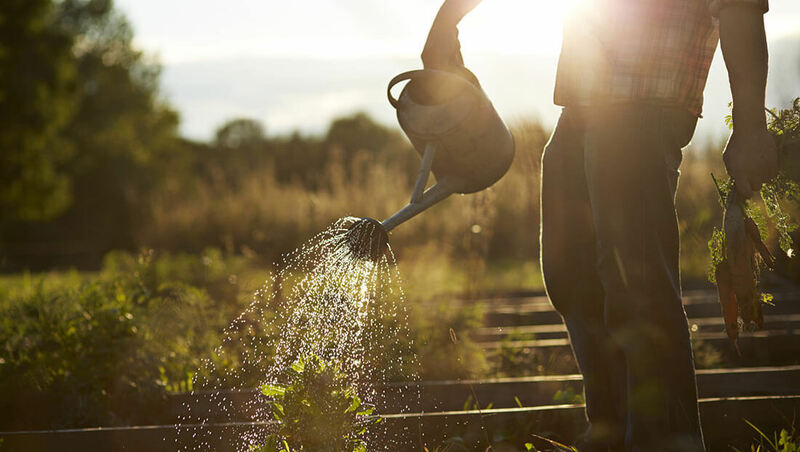 The first step even before considering when to water plants is the amount of water the vegetables you grow or intend to grow in your garden require. You can then decide to either water your plants early in the morning or later in the afternoon. We will discuss the reasons to support this gardening practice. The optimal time to water your indoor or outdoor garden is in the early morning at about 10 am. Why do we say this? Well, water in the soil not only sinks to be picked by plant roots; the same water is also lost via evaporation. Watering your vegetables early in the morning allows the water to sink to reach the roots of these plants. This will minimize the amount of water lost due to evaporation. If you do it in the later morning when the sun is up, the amount of water that will be lost to evaporation will be great. This will deny your plants the necessary moisture to support their growth and development. Another reason to support watering plants in the morning is the availability of the same water through the day. Water that has already sunk into the soil will evaporate at a much slower rate. This will improve the availability of water throughout the day. The plants will be able to deal better with the heat of the sun later in the day. You also need to know that watering in the morning integrates with your plant’s natural growth cycle. The morning sunlight is gentle and best for photosynthesis. So, your plants will naturally optimize their rate of photosynthesis early to mid-morning. Later in the day as the sun gets hotter, the plants will use the water to hydrate. Some people may relate early morning watering with scorching of outdoor vegetables. They claim that water droplets remaining on the plant leaves may focus sunlight on the plant leading to scorching. There is no scientific proof to support this claim. Scorching is a non-issue in most parts of the world. Very few parts of the world receive sunlight with enough intensity to scotch plants. In fact, no matter how intense the sun’s heat is, any water droplets on the leaves would evaporate much faster before they can cause scorching. However, if you believe the sun’s heat in the part where you live is too intense then you can go with an alternative watering time which we shall discuss shortly. The only reason why you would choose to water your plants later in afternoon is morning inconvenience. Since most of us are not full-time gardeners, it may not be convenient to water your indoor or outdoor plants early in the morning because of tight schedules. It is safe to water your plants later in the afternoon when the sun is not so hot. At this time, the chances of your plants burning or scorching are greatly limited. Besides, your vegetables will have enough time to dry out well before the nightfall. The optimal time to water your plants is at around 4 pm. The sun will no longer be at its hottest intensity at this time. You can stretch into the early evening if you must. Watering the plants early than 4 pm may predispose your plants to scorch. However, the situation may force you to water your plants later in the morning or early afternoon. Do this if you must but only occasionally. You should not make it a habit or you risk scorching all your vegetables and sustaining losses. Can You Water Your Garden At Night? As you have already learned, the best time to water your indoor or outdoor garden is early in the morning or late in the afternoon. But what can you do if you are busy at these times of the day yet you have a vegetable garden to tend to? Can you water your plants at night? Water droplets on leaves will sit there for extended periods due to lack of evaporation. The result of both effects is the growth of mold and certain fungi around the roots, on the stems as well as leaves of your vegetables. This will definitely interfere with the health and productivity of the plants. The only reason for watering plants at night is the hydration state of your plants. If your plants are too dehydrated to wait until morning, do it as a last resort. In this case, you have to use the right watering technique to avoid any negative effects. If you must do it, ensure you direct the water to the soil. Be careful to avoid the plant leaves and stems. You should also reduce the amount of water you use to avoid water-logging the soil. Make use of a soaker hose or an irrigation tape. This will make your work much easier. There you go fellow gardener. You now know the best time to water your indoor or outdoor gardens. Your plants will grow faster, healthier and happier. You can expect optimal yields from your garden. When making your schedule, ensure you create some time early in the morning or later in the afternoon to provide your plants with enough water to support their growth. Only water them at night as a last resort.